This year  the rainy season started late and was particularly dry in Somaliland. Under such difficult conditions, the population is condemned to survive with a very limited amount of water. 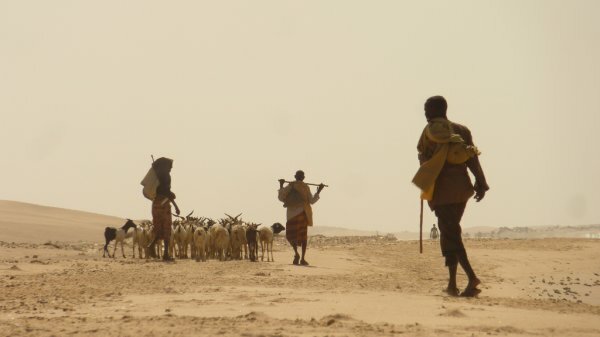 In Somaliland, droughts are not something new, but the unprecedented frequency of this phenomenon has raised environmental concerns, as the lifestyle of shepherds and farmers is under threat. Hargeisa, Somaliland — It has been particularly dry this year in parts of Somaliland, the internationally unrecognised nation-state that broke away from Somalia in 1991. Small, frequent droughts have left the land and its inhabitants parched. On a bumpy single-track dirt road just south of the capital Hargeisa near the Ethiopian border, a woman squatted over a shallow tire track imprint carved out in dried mud. The small crevice pocketed what little remained of a long-overdue recent rain. The woman, using a plastic yellow jerry can, scooped at the diminutive amount of water. When your livelihood depends on the generosity of the skies and they haven't been forthcoming, every drop counts. "It's definitely worse than last year," said Adulahi Ismael as he watched some of his dehydrated cattle drink from a derelict public reservoir near the southern Gumburaga Banaka village. The 60-year-old who is a father to 10 children, was on a six day journey from about 75km northeast of here, in search of water and fertile land that sprouted with green rather than desolate brown. It's the furthest he has had to travel in recent memory to find water. All of his small herd of cattle have survived this year coming off of a protracted dry season that should have ended in April. But many of his sheep, he said, weren't so lucky. Delayed and sporadic rainy season precipitation has left areas throughout semi-arid Somaliland, particularly in the west, dehydrated - the land is barren. At least 55 percent of the people in this self-declared Horn of Africa nation engage in some sort of pastoralism, with a smaller portion of that percentage engaging in a mix of farming and animal husbandry. Historically, this nomadic lifestyle of traversing the land in rhythm with livestock - camels, goats, cattle and sheep - in search of green pastures and ample rainfall, sustained populations in harsh environments. Drought is nothing new to pastoralists, but the life of chasing the rain has become increasingly precarious as factors like land degradation and climate change overshadow the capability of communities to cope in times of water scarcity. "Here you live by the rain. There isn't much else," said Jeremiah Njeru, who works for the Somali Water and Land Information Management team at the UN's Food and Agriculture Organization (FAO). The FAO tracks rainfall. Northwestern Somaliland received less than 25 percent of its normal precipitation this year, worrying numbers for Njeru. However, there is optimism that heavier rains of late June, the last month in Somaliland's three-month long principal rainy season known locally as "Gu", will serve as a lifeline for pastoralists until the shorter rainy season running September through October. While FAO wouldn't scientifically consider this season a drought yet in this region, the experience for pastoral communities is often completely different. A local sultan has only to point to the expanse of the plain lying between the Gumburaga Banaka village and the capital of the district, Baligubadle, in southern Somaliland to illustrate the lack of rainfall. "Last year it was filled with sheep, hundreds and thousands of sheep. You wouldn't even be able to drive a car through it," explained Sultan Omar Mohamed. In early June it presented an austere sight - desiccated and not a single piece of livestock in a 360 degree view. This sent much of the community on marches towards the eastern part of the country where this year, the rains had uncharacteristically began. Late rains in June have brought some back, filling water reservoirs, but there are no guarantees that even a downpour would bounce the land back to life. "The system is so sensitive now. Even if we say it's not a drought, the reality on the ground for people [... ] is that they feel it a lot," said Njeru. He argues the "silent killer" behind water-stressed communities is the lack of environmental stewardship at both the village and government level. Over-grazing, the privatisation of land, invasive species and the unsustainable cutting down of trees for charcoal production are just a few of the culprits transforming landscapes into dusty surfaces incapable of capturing water. Unlike in the past, Njeru said, "even after rain, after the third or second day, you don't see anything. There is no recovery". No water is absorbed. No grass grows. Livestock and crops die. People's livelihoods suffer, he added. Ahmed Awale, the chairman of the local environmentally focused NGO called Candlelight, like Njeru, emphasised the term "now" when discussing drought. He alluded to more recent environmental circumstances that challenge pastoralists. He pointed out that although pastoralists have always lived at the mercy of the rain, the recent droughts are definitely more frequent and the earth less forgiving. It is "extremely scary", he said, that as the world grows hotter and rains more erratic that this can dictate a person's livelihood. "Now if you have a below normal rainy season followed by one with no rain, it could be a disaster," he told Al Jazeera. Disasters draw headlines, often when it's too late, like the deadly drought that hit the Horn of Africa in 2011 affecting some 13 million people. In parts of Somalia, famine was declared after the drought and an inability for aid organisations to reach areas held by the militant group al-Shabab left thousands starving. But the ruinous effects of more frequent and less high-profile droughts like those that afflict Somaliland often go unnoticed. Omar Hurre has lost about half of his 150 sheep this year. Ironically, it was the rain that killed them. After growing thin and weak over the dry winter period from November to April and with no respite when the rainy season should have started, disease quickly spread through the flock when rainfall did finally come to the Gumburaga Banaka village. The 60-year-old man also farms food for extra income and self-sustenance. This practice has been encouraged by aid agencies and the government to provide people another means of livelihood outside of complete dependence on livestock. But crops also need water to grow. With no financial means to truck in water, many of Hurre's crops have also died. Some families facing similar and worse circumstances in the village, abandoned the lifestyle and moved to the capital as a part of what many aid organisations recognise as a wider trend towards urbanisation. Hurre envies them, he said with a laugh. He knows that Hargeisa would offer his seven children greater opportunities for education, but he also understands that his skill-set wouldn't take him far in an urban setting. Though, he thinks, not having to worry about precipitation would be a nice change. "Once you leave for the city, you never come back," he said.